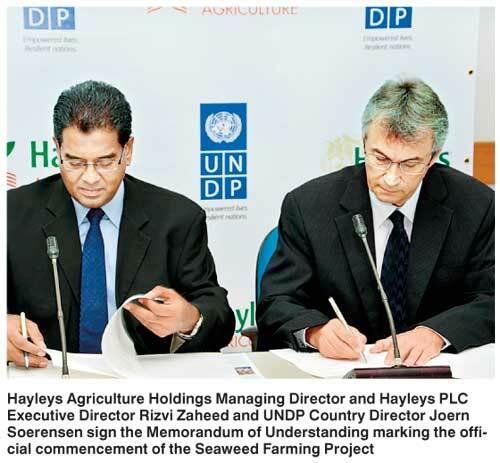 The United Nations Development Program (UNDP) in Sri Lanka partnered with Hayleys Aquagri Ltd., a subsidiary of Hayleys Group to expand seaweed farming in select islands in the Jaffna district. UNDP Country Director Joern Soerensen and Hayleys Agriculture Holdings Ltd. Managing Director and Hayleys PLC Executive Director Rizvi Zaheed signed a Memorandum of Understanding marking the official commencement of the Seaweed Farming Project. Through this partnership UNDP and Hayleys Aquagri Ltd will be collaborating in three islands, Analaitivu, Eluvaitivu and Nainaitivu of the Kayts and Velanai Divisional Secretariat Divisions. Phase I of this project, working in two of the most vulnerable divisions in the Jaffna district, will provide livelihood opportunities for 40 families of which eight are female headed households. This project will encourage communities to diversify their livelihood opportunities in an environmentally sustainable manner, based on a ‘Community-Based Aquaculture for Livelihood Diversification’ strategy. As part of the project UNDP will also collaborate with the Department of Fisheries, Department of Co-operatives and respective Fisheries Co-operative Societies to identify additional beneficiaries supported by this partnership, to initiate seaweed farming by providing breeding structures and culture materials. In addition to business development support, Hayleys Aquagri Ltd. will contribute their specialised technical support to the farmers enabling them to grow seaweed in a more efficiently and productively, and will also enter into buy back arrangement with each farmer to ensure a good price is given for the produce thereby ensuring a sustainable income for their families. Hayleys Agriculture Holdings Ltd. initiated a pilot project of Seaweed (Kappaphycus alvarezii) Farming two years ago in the Mannar District to help fishing communities to rebuild their lives and generate a steady family income. Hayleys is currently working closely with 250 fishing families and impacting their lives by providing an alternative source of income. UNDP through its flagship ‘Governance for Local Economic Development,’ (GLED) Program is working to improve socio economic opportunities in vulnerable regions in the country through the promotion of sustainable livelihood development. This Seaweed Farming Project is implemented by the third phase of the ‘Northern Livelihood Development Project (NLDP III)’ anchored under the GLED Program and funded by the Government of Norway. NLDP III aims to promote local economic development through enhancing market-based livelihood opportunities for vulnerable communities in the Districts of Jaffna, Kilinochchi and Mullaitivu.